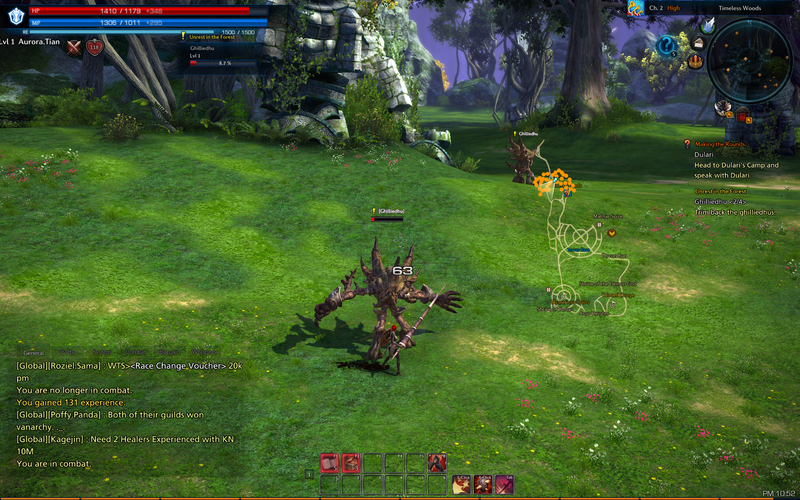 Another MMO on my list to check out was TERA, or is it now TERA Rising? The graphics are better than Ragnarok Online, but it does have that Asian character feel. The races are humans, elves, humans with horns (aman), elves with horns (castanic), hedgehog animal dudes (popori), young girls (elin), and badass serious looking giants (baraka). All things considered, especially compared to the NPC quest givers, this armor actually provides some coverage. So far the game is fairly themepark. Each quest giver has 2 or 3 quests which break down into storyline quest which leads you to the next outpost, or kill a few mobs that are reskinned versions of the ones you just killed at a previous step. The strength of this game is definitely combat, especially melee combat. The weapons are over-sized, ridiculously so, and it is fun to use them in crazy implausible combat moves. The game features 4 melee classes: beserker (giant axe), lancer (shield/giant lance), slayer (giant two-handed sword), and warrior (double swords). The tank class is the lancer, so I played that. Starting out, I had 2 skills: Combo Attack, and Stand Fast. For CA, my character would thrust her gigantic lance, and hit multiple times against a foe. Each hit generates a satisfying metallic clang, letting me know I’m inflicting some pain! I zoomed out – see how big the weapon is compared to my character? These two actions are bound to the left mouse button and right mouse button, so combat isn’t the typical “target enemy, hit num key”. It is more action RPG-esque (like what I remember of Diablo), perhaps a bit like DDO. 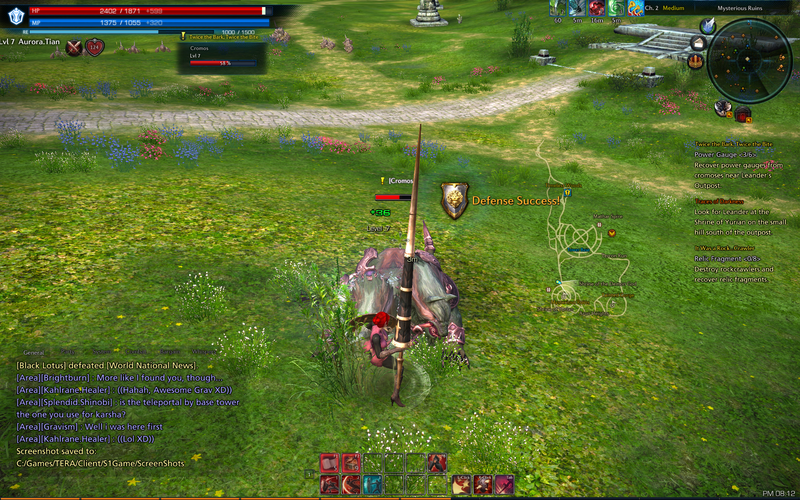 Combat is untargeted, so you need to move in range of your weapon, face the mob, and then click to attack. Otherwise, you can use a skill but you’ll just swipe at the air. The faster the clicking, the faster the attacks (up to a limit of course). The lancer’s defense move is SF, but the other melee classes evade instead of defend. The warrior does a front flip, while the beserker and slayer roll to the side (I think, I didn’t play them much). These skills require position awareness for maximum benefit – by noting what the mob is doing, you can dodge the attack, or in the lancer’s case, absorb damage. As you level you unlock extra skills, so it isn’t just left and right clicking. So far I have a charge and attack skill, an AoE shield swipe, etc. that let me mix up my offense a bit. I’m still on the starter island, and thus haven’t seen much of the game. 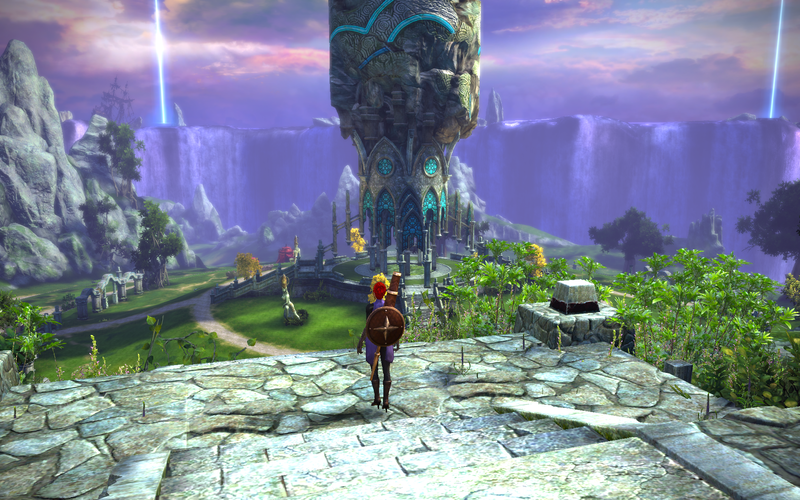 TERA isn’t breaking new ground in MMOs – the questing seems straightforward and almost bland. The strong point of the game is definitely the combat – it’s almost a console combat feel swinging giant oversized weapons and jump dodging or absorbing attacks.